Product prices and availability are accurate as of 2019-04-03 06:27:01 EDT and are subject to change. Any price and availability information displayed on http://www.amazon.com/ at the time of purchase will apply to the purchase of this product. 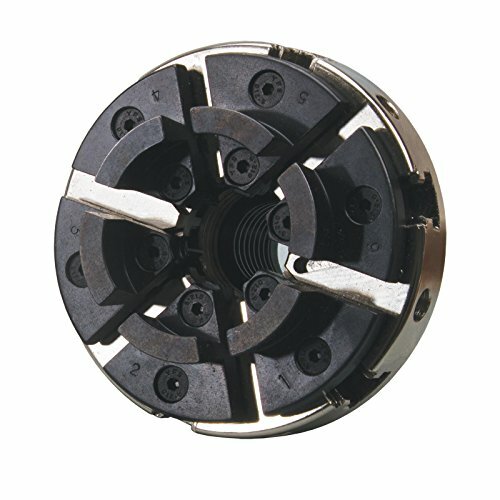 This exclusive and unique 6 jaw chuck is a welcome addition to our renowned barracuda family of lathe chucks. On a 4 jaw chuck, when you spread the jaws to accommodate a larger diameter turning base, you can actually get a small gap between the jaw and the wood in the center of the jaw. This gap does not occur on the 6 jaw chuck thus providing more jaw surface area grabbing the base. It is large enough and powerful enough to use on larger lathes (over 12"). as delivered, it adapts to lathes with 1-1/4" x 8tpi and 1" x 8tpi headstock threads. Weighs 3.85Lbs. Diameter is 3.94". body depth is 2.88". thread is 1-1/4" to 8tpi. Includes 1" to 8tpi adapter. (6) #2 round dovetail jaws. Also includes a screw chuck. Gripping outside is 2-1/2" to 3-1/4". gripping inside is 2" to 2-3/4". lever operated.